Sometimes a ballet program is like a sandwich, with the filling stuck between two slices of white fluffy stuff. So it is with San Francisco Ballet&#146;s Program 2. It&#146;s not that Antony Tudor&#146;s Gala Performance and Stanton Welch&#146;s Taiko are bad ballets. They are fun, in their different ways, if inconsequential. 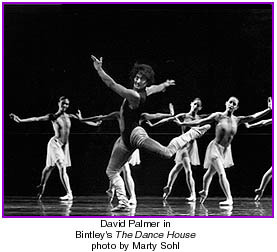 It&#146;s simply that David Bintley&#146;s The Dance House is so good. Let&#146;s get right to the meat. Bintley&#146;s gripping meditation on the AIDS epidemic had its world premiere in San Francisco just five years ago. Then, before the advent of drug therapies that have given some hope to many with HIV disease, it must have been heartbreaking to watch. Today, it is hardly less so. Set to the First Piano Concerto of Dmitri Shostakovich, it has no story but much content. Against muted earth tones, vivid touches of red &#150; one leg of a dancer&#146;s leotard, a stripe down the front of a costume, a belt &#150; seem to be quiet screams for help. As the curtain rises, the corps warms up at a ballet barre (also bright red) at the rear as leggy, ethereal Katita Waldo dances center stage. She soon is joined by a figure that only can be construed as Death, his face a white mask, his costume suggesting the organs underneath the skin, his legs seeming to be smeared with blood. Yuri Possokhov is wonderful in the role, languid and powerful at the same time. He beckons, seduces, selects, ignores some and embraces others. In the end, he is all that is left. Possokhov partners Waldo, seeming to dance her to death. Then a couple enters &#150; on Saturday night the wonderful Joanna Berman and Stephen Legate &#150; for an elegiac pas de deux that is a poem in motion. In time, Possokhov appears again and it ends in a tragic pas de trois. In the Third Movement, Vanessa Zahorian and Gonzalo Garcia are a frantically cheerful duo, dancing as if there was no tomorrow – which, of course, is the point. Possokhov, the corps and the other principals join them until, as in the nursery rhyme originally written about another plague, "Ashes, ashes, all fall down." The Dance House is a powerful statement about the devastation of an epidemic; it is all the more powerful because of the toll AIDS has taken on the dance world in particular. Still, this triumphant work of art surely transcends the specifics of here and now. Nobody has ever called Gala Performance a work of art. Tudor&#146;s light-hearted sendup of the conventions and pretensions of the ballet world pits three ballerinas &#150; a Russian, an Italian and a Frenchwoman &#150; against one another at a fictitious gala. The first scene, which takes place backstage, establishes not only that these these are affected and self-centered, but also that they don&#146;t dance very well, which is hilariously illustrated once the performance begins. It takes a high degree of technique to pretend not to dance very well and Lorena Feijoo as the imperious Russian, Muriel Maffre as the haughty Italian and Tina LeBlanc, the coquettish Parisienne, give it all they&#146;ve got. Feijoo gives it even more, in an over-the-top performance that had some members of the audience rolling in the aisles. But, just as each of these dancers milks the applause ad infinitum, so Tudor milks the joke, having them upstage each other and their partners repeatedly. Maffre (although it is not her fault) grows especially tiresome as she stalks slowly back and forth across the stage. The Ballets Trockadero de Monte Carlo does this kind of klutzing around a bit more convincingly, perhaps because they are men. It is worth sticking around for the bows, however, when Feijoo snatches up all the bouquets until she is fairly staggering offstage under their weight. If you like drumming, Taiko may be for you. With a vaguely Australian theme, it is energetic, with angular, quirky movements on the part of the ensemble, balanced by the graceful posturing of a female figure (Yuan Yuan Tan, a rising San Francisco star who is fairly wasted in the role) identified in the program as Belief. With a backdrop that changes from urban steel to a nightscape to a blazing sun, it goes on endlessly and essentially goes nowhere. Choreographer Welch is quoted in the program as saying, "I think the ballet needs to be mysterious." At least he succeeded in that. As a matter of fact, it&#146;s a mystery to me how this ambitious, but uninteresting work ever made it to the stage.